Здравейте! Вашата обява ме интересува. Моля изпратете по подробна информация за обява Габрово област, Велковци (№ на обявата 173). Благодаря! За повече детайли по офертата изпратете директно запитване от дясната колона.Област Габрово, село Велковци, продава стара селска къща, стопанска постройка. [EN]Gabrovo Region, village Velkovtsi. We offer for sale an authentic old bulgarian house..
Gabrovo Region, village of Velkovtsi. 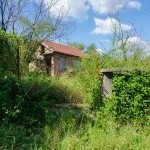 We offer for sale an authentic old Bulgarian house. The yard is equally divided into two parts-one is planted in a small pool and children's games and recreation area, the other residential building, shed and stone barn. The house is detached kitchen, two bedrooms facility. The roof structure is strong, covered with stone slabs, but needs revision. The property is suitable repaired for rural tourism or permanent residence because of its proximity to the town of Gabrovo. The the western part of the property has a well that needs cleaning.